Angus Konstam examines the 2nd Seminole war in Dade’s Last Stand. Stephen Turnbull looks at the surprising similarities between Knights and Samurai. M Brayley assesses the role of Uniform technology in the UN’s struggle in the Korean peninsula, whilst Ryan Lavelle asseses tthe impact of the dynastic struggles in 9th-century Wessex. In Blue and Gray on the Nile, David Nicolle shows how US Civil War soldiers had a profound effect on the development of the Egyptian army. 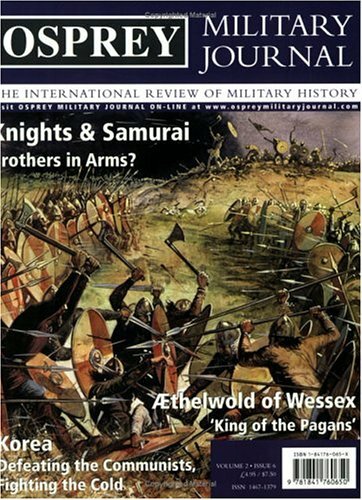 Bi-monthly from the world's leading publisher of illustrated military history books, the Osprey Military Journal makes essential reading for history enthusiasts everywhere.